A growing perception of corruption in Latin America, most recently in Brazil and Chile, is eroding confidence in two of the region’s most dynamic presidents – Dilma Rousseff and Michelle Bachelet. The Chilean and Brazilian corruption cases are both serious, but differing perceptions and expectations in the two countries suggest the scandals will have different impacts. Chile has long been the darling of economists and political scientists (and U.S. policymakers) in terms of democratic maturity, economic development, and transparency. The use of political influence to secure millions of dollars in sweetheart loans there has pulled the country down from its high perch, and since the issue directly touched President Michelle Bachelet’s own family members, it has become a huge deal in and outside Chile. Although among the six main economies in the world and alone among the BRIC countries in boasting a stable democratic system, Brazil, by contrast, has repeatedly been tainted by corruption scandals that would lead to the fall of most Scandinavian governments in a matter of days. Former President Lula’s son became a millionaire while his father was in power, yet this fact hardly stained the ex-President’s popularity. The scandals weighing down President Dilma Rousseff are different. Brazilian citizens customarily have thought of Petrobras, one of the few remaining state enterprises after the wave of privatizations under President Cardoso during the 1990s, as a great source of national pride, and this sentiment was encouraged by the PT government, never a fan of the neoliberal predilections of its predecessor. So when the scandal touched almost all of the party’s leaders, in addition to the prized national oil company, even Brazilians inured to corruption felt pain. Moreover, Lula and Dilma’s party, the PT, had promised to do politics in a different way. As a union leader and a woman who fought against the dictatorship, respectively, they represented the rise to power of leaders based entirely outside the traditional parties and their murky ways of doing business. Now, some of Dilma’s disillusioned supporters are demanding her impeachment, and many famous artists who once endorsed the PT are feeling betrayed. Latin American voters have long manifested contrasting expectations of their presidents – cynicism about their venal nature coincided, as Latin America specialist Guillermo O’Donnell once said, with hope that they be “acclaimed saviors.” Within the codependent relationship between citizens and politicians, trust is impaired once betrayal surfaces, but the marriage normally continues. In some cases of rupture, as happened with impeached President Fernando Collor in 1992, it hasn’t meant the end of the political affair. In the October 2014 elections Collor was reelected as Senator for the state of Alagoas. 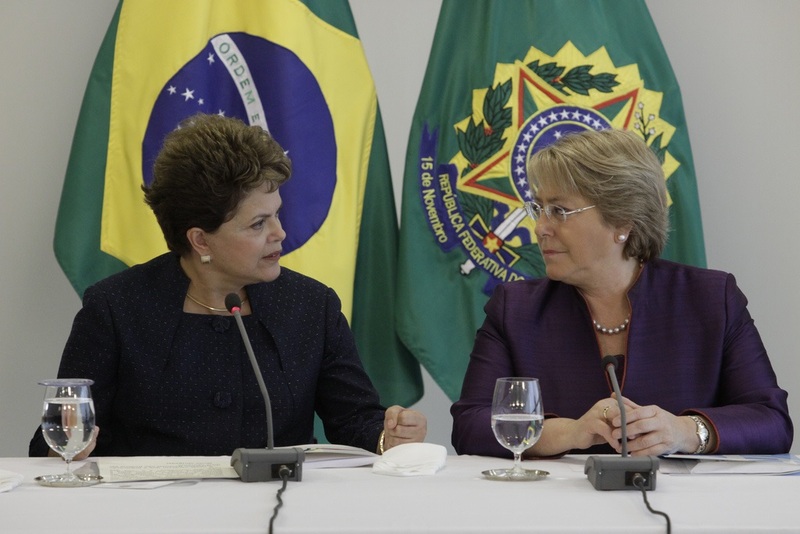 Dilma and Bachelet have already said they will not resign, and that they intend to implement a comprehensive cleanup. The road will be easier for Bachelet. The Chilean scandal is still small and remains manageable, and although the decline in commodity prices has already affected the country’s economy, further taxing Bachelet’s popularity, Chile has a sovereign reserve fund to cushion any blows. For Dilma the conjuncture is considerably bleaker. She was on the board of Petrobras while its executives were engaged in costly shenanigans, and it is now known that the fraudulent scheming also involved the Health Ministry and the state-owned bank Caixa Economica Federal. And in Brazil, in contrast to Chile, the fiscal situation is sufficiently tight as to constrain the president’s room to maneuver as the commodity-driven economy stagnates. At this point both women appear likely to survive their challenges, but the road ahead looks a lot tougher for Dilma than for Bachelet.